It is rare to travel to a place that doesn't remind you of anything you have ever seen. Bali is that place. Many people travel there for the beaches and the parties. I went there for the culture and the unmistakable photography opportunities. The island is lush, tropical, modern and developing at the same time, and uniquely Hindu which permeates through the region. I will let the photos do the talking. Getting to Indonesia from LAX required two flights, with a layover in Taipei. When we landed in Denpasar, the airport was remarkably modern with a mix of Dutch and Indonesian architecture. Outside the airport were Hindu temples dotting the sidewalk in between commercial buildings. 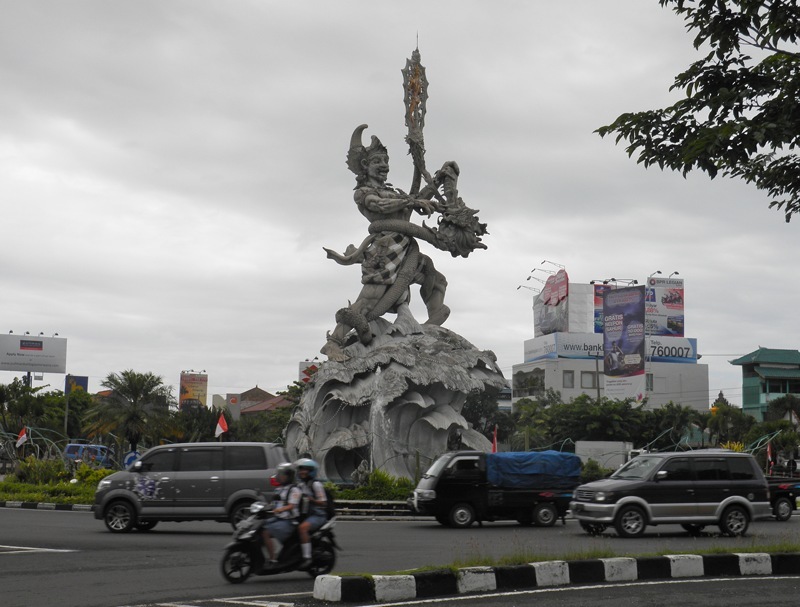 The roadways had Hindu gods in the median. We passed by Banyan trees, wrapped with black and white sarongs. The hot and humid air and smelled of smokey incense. It was clear that we had landed in one of the most culturally interesting locations. We took a taxi to our hotel and along the route were Western billboards, surf shops, and craft stores selling every kind of raw material from wood to stone statues. The street life in Indonesia was fascinating and completely opposite to the Western roads of structure and insurance laws. The roadways in Bali were swarmed with motorscoters - whole families on motorscooters, kids without helmets, drivers carrying giant bushels of produce, Hello Kitty helmets. I could stay entertained just by watching them out of my car window. The first Hindu temple we went to is Tirta Empul Temple. This is a Hindu temple built in 962 AD famous for its holy spring water. The fountains are used by the Balinese Hindu population (and tourists) for ritual purification. Many people were giving offerings, or small palm leaf baskets filled with flowers, candies, coins, incense, crackers, and even cigarettes to the gods. As our tour guide explained, Balinese Hindus believe in one god, but many manifestations in god. This is an active volcano on Bali that last erupted in 2000. ​The mountain draws adventure tourists for trekking, especially at sunset and sunrise. Whether you are photographing it from atop the mountain on below, it is impressive. This is the iconic Hindu temple. In fact the image of the temple is on the Indonesian 50,000 Rupiah bill (equal to about a $5 US bill). It is located on Lake Bratan and surrounded by lush gardens where many locals go for picnics and family gatherings. The temple was built in the 17th century in worship of the main Hindu trinity, Brahma-Vishnu-Shiva, as well as the lake goddess, Dewi Danu. The temple is used as an offerings ceremonial site for the lake goddess. The worshipers paddle out on colorful boats to deliver the offerings. The town in the center of Bali is called Ubud, known for its plentiful rice terraces, which are a UNESCO World Heritage Site. We hiked through the terraces, which are tiered platforms of rice covering the mountainsides. We even spotted the farmers plowing and seeding the rice. There is so much to cover in Bali that I will have a Part 2 to cover more beautiful sights. What are your favorite places to photograph in Bali? Mexico City is the ﻿cosmopolitan capital of Mexico﻿ that is home to 22 million people, a vibrant culinary scene, rich Aztec and colonial heritage, archaeological sights, and many surprises. On my trip, I discovered so many unique UNESCO World Heritage Sites, museums, and architectural gems that my list of sights to photograph ended up being quite long. Luckily, many of the sights are clustered near each other and I will post another blog post on how to efficiently sight see in Mexico City. Chupultepec Park is more like a forest and 2-3 times the size of Central Park. It is filled with merchants selling everything from elote, to popcorn, to dorilocos (yes, it is a real Mexican creation). The park also has numerous museums and a castle...which leads us to the second photo shoot location. The only "real" castle that housed a reigning monarchy (Mexican Emperor Maximilian I) in North America. It sits high on a hill with a view of the city and park. There is no wonder this museum got a five star average rating from about 10K reviews on TripAdvisor- it is one of the finest anthropology museums in the world. The architecture, presentation, and collection are spectacular. There are indoor and outdoor exhibits that include Mayan and Aztec art, including the Aztec calendar and sacrifice stone. Built on top of the ruins of an Aztec temple, this plaza is the second largest plaza in the world and the epicenter of Mexico City's political seat. You may recognize the buildings from the opening scene of the James Bond movie "Spectre". Museo Soumaya is in the Polanco district, which is like the Beverly Hills of Mexico City. The building is an architectural gem made of reflective tiles. The building was commissioned by Carlos Slim (one of the richest persons in the world) to house part of his art collection. Best of all, the collection is free to view. A 28 KM drive south of Mexico city is Xochimilco, one of the most unique areas of Mexico. This area used to be a lake in pre-hispanic times which the Aztecs converted to an extensive canal system and artificial islands in order to build their habitat. Today, this area has been preserved and is a UNESCO World Heritage site that has been described as the Venice of Mexico. We boarded the Trajineras, or colorful boats, that ride up and down the canals, used mostly for tourism and local celebrations. The boats have a long tables in the middle for picnics. There are even boats that come up alongside to sell a variety of food, beverages, and entertainment in the form of mariachi music. We even got serenaded with the Macarena! It is quite a fiesta! Frida Kahlo's museum and house is located in the Coyoacán neighborhood and cannot be missed (literally) because it stands out in a bright blue cobalt color with green window shades. The museum is one of Mexico City's most visited museums, as Frida and her husband Diego Rivera are arguably Mexico's most notable artists of the 20th Century. She lived in the house, and her bedroom and studio are on display in the museum. I recommend getting tickets to the museum in advance, as the lines can last over an hour for entry. Reforma Street is one of the most beautiful boulevards in Mexico City, modeled after European boulevards. On Sundays, the street is closed off for the afternoon for the biking program. Bike rentals can be purchased alongside the street at kiosks and are free for the first hour of riding. It makes for a fun and active way of touring the city. Built in the 18th century, this architectural gem is located a block or so away from the Zocalo and features white and blue tiles on the outsides, balconies and an indoor courtyard. It is rare to see historical buildings in Mexico City because many have been rebuilt or re-purposed until the 1970's laws for heritage protection and restoration. This building was built at the beginning of the 20th Century and features eclectic architecture, a unique staircase, dome, marble floors and elegant facade. This library has stunning modern architecture. View the design from the interior and go a few floors up to get a grand look at the stacks of books. The tallest observation deck is from Torre Latinamericano. However, some hotels and rooftop restaurants have excellent views of the city for the photos of the panoramic skyline, i.e the Hilton Reforma. This is one of the most prominent cultural centers in Mexico City, recognized by it's prominent yellow dome. It was built in the late 19th Century in Art Deco style as well as a mix of other architectural styles. It also contains murals by Diego Rivera and Siqueiros. The building houses the opera, theater, and ballet in Mexico City. The best view is from Sears across the street. This is the largest Cathedral in Latin America built on the site of the Templo Mayor of the Aztec city Tenochtitlan. This hotel was featured in the opening scene in the movie Spectre and is noted for its historic sophistication and Old World elegance. Alesund is a a seaside city in Norway that offers countless nature hikes, fjords, and places to photograph. The city of Alesund is an easy day trip from Oslo, and the plane ride is worth a trip in itself as it offers a scenic view of the fjords. There city is easily manageable for a day trip, as the center of town is compact and quaint, filled with cobblestone streets and shops and nearby hikes. The city has a unique history as it experienced a devastating fire in 1904 and has since been rebuilt in Art Nouveau Architecture. View our gallery for the photography of Alesund. The harbor of Alesund is fishing village filled with boats and lined with cobblestone streets, flowers, and quaint restaurants. Many of the shops are closed on Sundays, however many restaurants and museums were still open. We were even greeted with a street procession from one of the town churches. Bring your hiking shoes to Alesund because the views from the tops of the peaks are stunning. TheFjellstua hike can be seen from the harbor with a series of switchback steps that lead to the top of the mountain. Although the steps look daunting from below, it takes only about a half hour to climb the 418 steps and the trail has plenty of vantage points to stop and take photos. The top is a rewarding 360 degree view of the city and fjords. There is also a restaurant where visitors can enjoy the view, as well as additional hiking trails. The city offers an excellent museum called Jugendstilsenteret, which provides the story behind the city of Alesund. Every fifteen minute is an interactive time travel presentation that provides an interesting context into the history of Alesund and its rebirth after the fires of 1904. View the gallery of Alesund here.